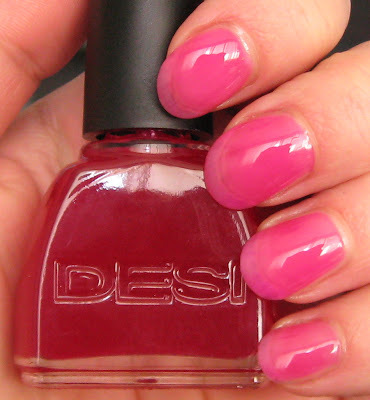 Above & Below: The photo above shows one coat of Desi No. 49 over Anna Sui No. 380, while the photo below is the Anna Sui before layering the Desi over it. The Desi doesn't change the look drastically, but rather, enhances and somewhat magnifies the glitter. Below: Desi No. 49, shown using 2 coats, is a jelly finish that has an incredible gloss to it. It's quite sheer on it's own, but I imagine that it would be very useful for layering as I've shown, or even as a Franken base. Through the kindness of Lynn, one of my readers, today's look was not only a gift from her, but also a recommendation. She suggested putting the Desi polish over the Anna Sui for an even prettier look. I have to agree that she is right! Anna Sui No. 380 is a glitter pink/violet shade that has an extreme amount of glitter in it. It has the rose scent, and of course the bottle design is nothing short of gorgeous. It actually covers just fine on it's own using 2 coats, but as Lynn told me, the Desi polish, which has a clear reddish/pink jelly finish, really enhances the look. I love the finish on this Desi when used alone, although I'm not crazy about the sheerness. It definitely offers up a lot of possibilities though, and I'm wondering which other ones they might have with this type of finish. Their web site isn't too much help in that regard, so if any of you are familiar with the Desi line, share some of your knowledge with us! Can you still smell the rose under the Desi? Mary, these are so pretty combined. They definitely enhance each other! I love it. What pretty polish. I own one Anna Sui bottle of polish. It's a light sheer shade. It was the only one I could find on Amazon.com. I love the rose scent. That shade is gorgeous alone and with the Desi on top. The Desi is also pretty. It's so shiny and the color is lovely. I usually don't like sheers but this is pretty. Looks fantastic on you. gildedangel~I think so too, thank you! Nicole~it's interesting how that Desi works. Love it alone for the finish (not the sheerness though) and as an "enhancer"! Angie~it really is quite the jelly finish! Just wish it had a little more color, but then of course it wouldn't work as well as a top coat. SilhouetteScreams~it's so pretty in real life. Quite sparkly! Lucy~the rose scent is really nice once it dries. I found the Desi to be a very interesting addition to my collection, love it!